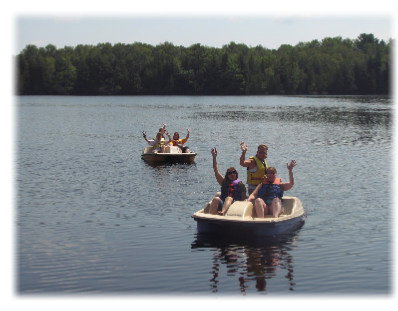 We have two canoes and two paddleboats, free for our guests to use! 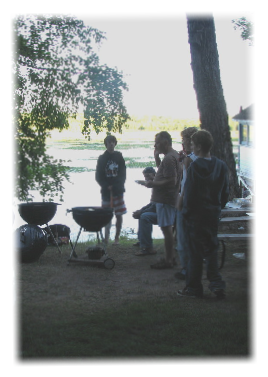 All units come with fully equipped kitchenettes including stove/oven, refrigerator, microwave, toaster, coffee pot, pots & pans, dishes, a charcoal grill, and a 14' rowboat. Motors are available to rent. Beds are made up with linens, blankets and pillows. Towels, soaps (personal & dish) & paper goods are not provided. Our heated outdoor swimming pool goes from 3 feet to 8 feet. There is also a playground and a game room in the Knotty Pine Bar with pinball, darts, and a pool table, and a sauna in the bathhouse for winter fun.